I may have mentioned before how we have outgrown our house quickly! When we moved in about 5 years ago we were a family of 4. Back then I had a craft room, but lost it quickly when Nolan came along. Rooms have been moved around a couple of times and when Sadie came around eventually the best solution was for her and Nolan to share rooms. We are making it work. When we combined their things I did no decorating in there, it was mostly toy organizing. I guess I felt like there was so much stuff in there already I didn’t want to add more to it. 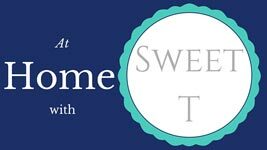 Well that was just a silly thought and recently I have been trying to add some fun to their room as well as defining spaces. 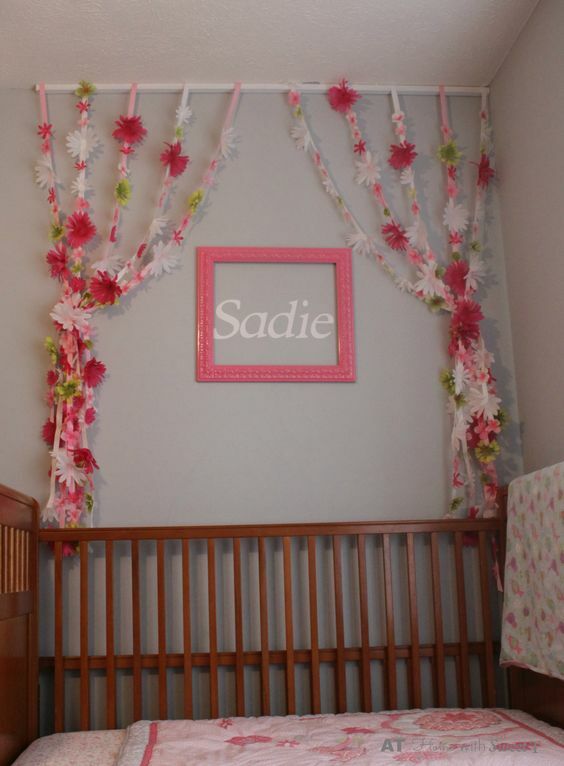 So for Sadie I added Flowery Streamers just above her bed. It was finally nice out like spring weather or as I like to call it spray paint weather. This was a piece of scrap but it’s about the same as a 1 x 2. I measured her crib and it was 57 inches so I cut the 1 x 2 down to be 57 inches. Her bed is in the corner so I wanted it to go from edge to edge of her crib. If I had the space and could center her bed on the wall I might have gone a little longer but being in the corner going longer would have made it hang over on the opposite side more. This is just white spray paint. I don’t know the point of having something too small to spray on because yes I have white grass now. Last year I made these streamers for Sadie’s 1st birthday, so glad I saved them. They were easy to make I bought several bunches of flowers from the dollar store and some ribbon in pink and white. Pulled the flowers apart from the stems then just glued them flowers to the ribbon using hot glue. There were 12 streamers and they were the perfect length to fit from ceiling to the top rail of her crib. I attached only 10 of the streamers with a staple gun to the backside of the painted 1 x 2 so that the ribbon would come up and over the board to hang down. Then using a trim nailer I secured the 1 x 2 to the ceiling above her crib. With the ribbons coming around the board I was able to hide those nails behind the ribbon. And I could have stopped here because it is cute too but I had a little more I wanted to add. I parted the streamers in the middle and pulled them to the sides. Using the last two streamers to tie them back. For a short time Sadie’s crib was in our room. We had a pink spray painted frame and her name cut from white vinyl using my Cricut above her crib. I added them to her new space. Do you have siblings sharing rooms? Here are a few more projects you might enjoy. bedroom decor, girls, spray paint. Bookmark.